Brief Description: The FIFA World Cup is one of the most eagerly anticipated events in the sporting calendar, with the World Cup final attracting an estimated global audience of over 700 million people but how much do you really know about this major football tournament? Who is the all-time leading goal scorer in World Cup finals up to 2010? What was the name of the World Cup winning England captain in 1966? Who is the only player to score a hat-trick in a World Cup final? These are just some of the 350 challenging questions in this new quiz book. Covering the vast history of the World Cup, this book includes records, milestones, goal scorers, World Cup firsts, legends and trivia. Recall classic performances from legendary greats such as Pele, Cruyff and Maradona as well as modern day superstars like Lionel Messi and Cristiano Ronaldo. This riveting quiz will inform, entertain and undoubtedly test your knowledge of the ‘greatest show on earth’. Whether you are a long-time aficionado of the beautiful game or a World Cup novice, this is a must-have for all football fans. About the Author: Carl Franks was born in Birmingham and always had a great passion for sport, playing football, tennis and cricket competitively from a young age. Having enjoyed a successful business career in the entertainment industry for over 20 years, Carl now likes to relax with the occasional ‘leisurely’ game of golf! A passionate football aficionado, and lifelong Aston Villa fan, Carl is thrilled to be able share his wealth of sporting knowledge to a wider audience with the publication of The World Cup Trivia Quiz Book. Today, Carl lives in Warwickshire with his wife Melissa and their two children. Carl Franks has come up with a real winner here. 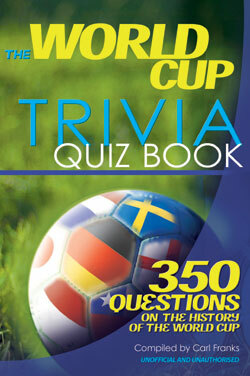 350 questions to test the knowledge of any fan of world football. The book covers a very wide history of all the major countries' involvement in the World Cup right up until the finals in 2010. If you love your international football, you will want to have this book.